Director George Cukor (Gaslight, Adam’s Rib) adapts this stage play about a wealthy couple who invite a handful of high society friends for, you guessed it — Dinner at Eight. Everyone’s got a problem or a secret they’re grappling with, and everyone seems to be connected to each other in some way. Lionel Barrymore’s on the verge of losing his shipping company while John Barrymore plays an over-the-hill actor struggling to find work. Wallace Beery and Jean Harlow are very unhappily married, with Harlow seeing a doctor (Edmund Lowe) on the side. 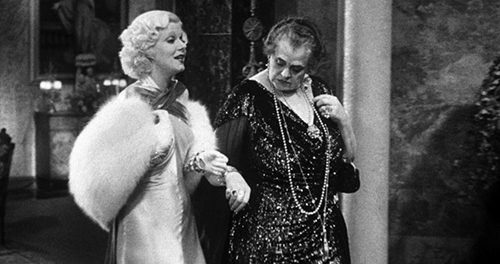 Then there’s Marie Dressler as a nosy busy body who wants to sell her stock in Lionel’s company, and Billie Burke (The Wizard of Oz) as Lionel’s high-strung wife and dinner planner. I found myself eager to get through all the build-up and arrive at the dinner scene. I’ve always loved dinner scenes with great ensemble casts. Unfortunately, the eponymous meal never actually happens. Instead, Dinner at Eight is a series of encounters between various characters who all come together for about five or ten minutes at the end when everyone’s problems are resolved. Well, except for one character. But you won’t get a spoiler from me. With Jean Hersholt, Lee Tracy, and May Robson.